oin Vicki Barbolak on her around the world Trailer Nasty Tour in 2019! You've seen her on America's Got Talent, now see her live! 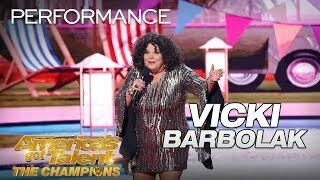 Vicki Barbolak was a fan favorite and Top 10 finalist on the 2018 America's Got Talent show. Howie Mandel told Vicki and America; "I think you just came up with your own sitcom, Trailer Nasty. There’s room for someone like you in a sitcom, your wonderful I love you." Come and see for yourself. When Vicki was 38 years young, she saw an ad for a stand-up comedy class. That class changed her life. Vicki quickly realized that making people laugh gave her more happiness than she ever dreamed possible. After a few years of open mic nights, Vicki was taken under the wing of Mitzi Shore, owner of The Comedy Store where Vicki developed as a Comedian. In the 20 years since, Vicki 's been named a member of Jay Leno's NBC Laugh Squad, won Funniest Mom in America on Nick @ Nite, has been featured by E! Television as the “Next Breakout Star to come from The Comedy Store”. Vicki's comedy reflects life as a Mom, her many marriages, and her love of the southern California Trailer Park Lifestyle.